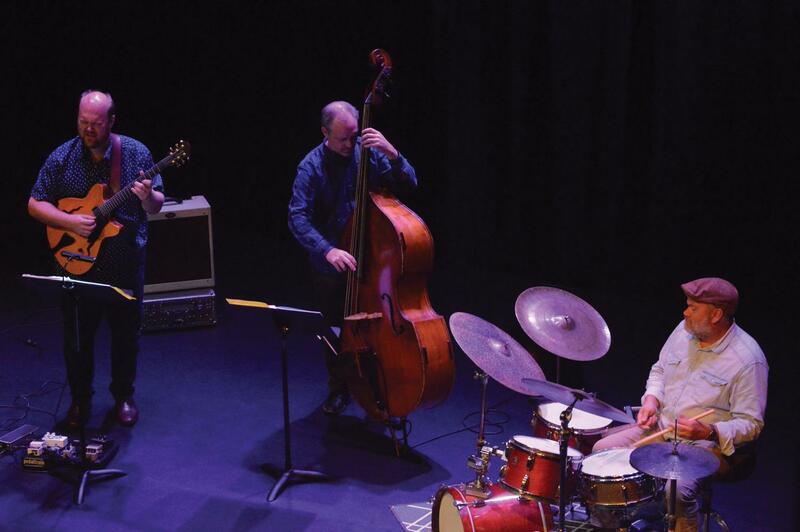 Members of the Brian Jones Trio playing for a crowd of music lovers at the Performing Arts Center on Sept. 26. Jones has recorded music with Jason Mraz, Boyd Tinsley and others. FMU hosted the Brian Jones Jazz Trio at the FMU Performing Arts Center (PAC) on Wednesday, Sept. 26. The performance, which began at 7:30 p.m., lasted for two hours while the trio performed for a full house. Adam Larrabee plays the guitar for the trio, while Brian Jones plays the drums and Randall Pharr plays bass. Joe Sallanger and Fran Coleman organized the event to enrich and broaden the student’s musical palates. The audience consisted mainly of FMU students from various backgrounds who attended because of their connection to art and music classes. Others were jazz fans including FMU professors Mark Blackwell, professor of philosophy and religious studies; Matthew Turner, associate professor of philosophy; and Lorianne Turner, associate professor of biology. FMU sophomore Samantha Devine and her grandmother Doris Devine attended the jazz trio together. Doris said she and her granddaughter love attending these types of events on a regular basis, but this time Samantha was attending the event for more than just pleasure. Samantha said she was also attending the event for a music appreciation class assignment. Samantha said she enjoys going to group performances, but she prefers watching solos. “I love events like this because it gets me and other students out of their comfort zone and trying stuff that they might not have ever tried without an event like this,” Samantha said. Blackwell said he loves events like this because he enjoys seeing the personality of the musician come out through their music. Coleman is also a jazz enthusiast and said she has been a fan of Jones for a while, and even attended the same undergraduate school as Pharr, Larrabee and Jones. Coleman’s biggest piece of advice for students pursuing a career in music was to network. She said these relationships will be very important for them and they will open doors, which is very important in the music industry because of its small size.